Dawn Senior lives in the hand-hewn log cabin, built by her family, where she was raised in Wyoming's rugged Snowy Range foothills. 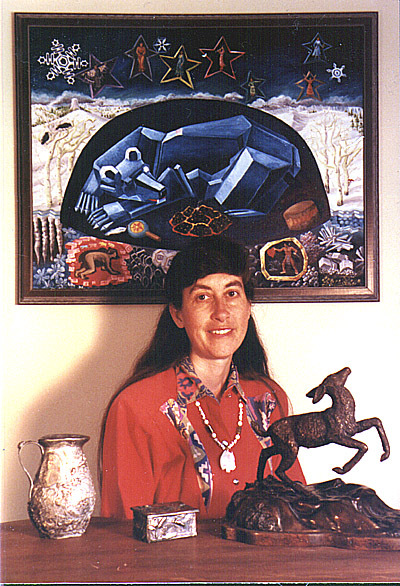 Dawn's art and writing spring from her experiences with wild animals and with Navajo and Hopi friends among whom her family lived for 5 years. After 8th grade Dawn's father taught her at home; he was a published author (Smoke Upon the Winds, Swallow Press, 1961*) and professional artist (Graduate National Academy School of Fine Art, NYC). Dawn attended the University of Wyoming and Hastings College in Nebraska, studying life drawing, printmaking, bronze casting, creative writing and literature. She travels throughout Wyoming and South Dakota as an artist-in-schools and has worked as an editor for her family's small press, Willow Bee Publishing House. Dawn's poetry, essays, woodcuts and pen-and-ink illustrations have been published in literary magazines, chapbooks and anthologies, including Leaning Into the Wind and Woven On the Wind (Houghton-Mifflin, 1997 and 2001). Her book of poetry co-authored with B.J. Buckley is titled Moonhorses and the Red Bull. Her bronzes, oil paintings and woodcuts have been shown regionally and are owned privately in many countries and across the U.S.
Go to Dawn's websites: Dawn Senior-Trask Fine Art and Moonhorse Art Studio .